Magazine and Review of Thought--Combined with "The Light of India". Los Angeles, CA. Publisher: Indo-American Publishing Company. Editor: Baba Bharati. 3/1, November 1910-1912(?). $1.00 a year, 48-32 pp. This was the continuation of Bharati's Light of India after his return from India in July 1910, and the volume numbering continues that of its predecessor. On Bharati, see the note under that journal. When his proposed mission mission back to India failed for lack of money, Bharati traveled again to the United States, this time transformed from the simple "Baba" of his earlier visit to "World-Renowned illuminated Hindoo Sage, Author, Writer, Preacher, Orator, and Ascetic," "The Henry Ward Beecher of India." His stated purposes in returning from India were to build a Hindu temple (proposed plans for which were printed in the journal) and found an industrial school to train young Americans in the native languages to educate ("uplift") Indians, especially Indian women. The latter was a considerable change from his earlier promotion of India as progressive and superior, but the journal continued his general anti-western and anti-Christian tone with the likes of "Western Thief of Eastern Thought" (Mary Baker Eddy), "Appolonius of Tyana: His Journey to India," and "Hinduism's Influence on Christianity." Bharati contributed regular "Mystic Musings" and long essays on the likes of "Tolstoy the True Christian," and the journal contained excerpts from Tolstoy, Ramsay Macdonald, M.P., Moncure Conway, and Dr. Heinrich Hensoldt (the literary opponent of John E. Richardson, on "The Ascetics and Mystics of India"). Contributions by Ella Wheeler Wilcox, Henry Christeen Warnack, Julian Hawthorne, Delores Cortes, "Queen of the Gonzales [Gypsies]," Lillian Gail Armstrong, L. Byrd Mock, M.A., Mary Walton, Rose Reinhardt Anthom, Mary Winchester Abbott, Rachel Maud Parker, A. Christina Albers, Maud Lalita Johnson, Florence Crane, Elsa Barker, and Thomas Edgar Mason ("Psycho-Physical Science of Breath"). The journal fails to convey any sense of enthusiasm or optimism and is largely "oriental sketches" and travel stories, which was probably reflected in the circulation. 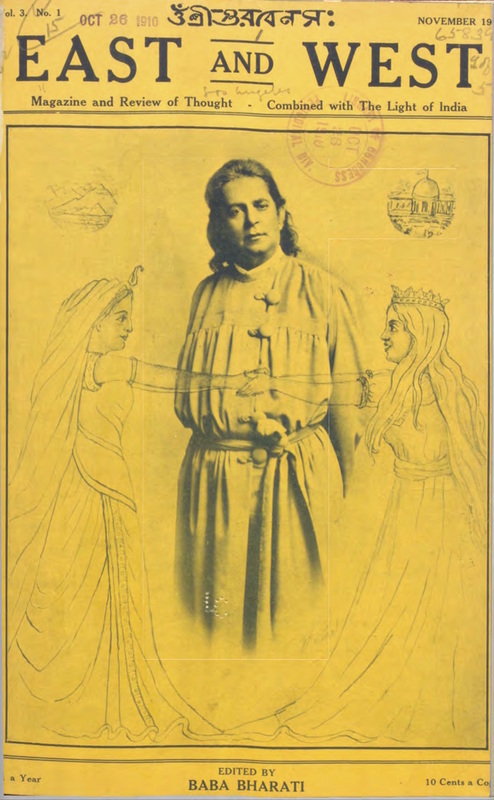 Unlike its predecessor, the journal carried few advertisements other than those for Bharati's own works and the occasional advertisement for Sister Onfa's Higher Occult Life and "Ulric's" solicitations for correspondence for those seeking "Soul Sight and allied powers, and seems to have tried to succeed by offering extravagant premiums and bundled subscriptions. These apparently didn't work, and Bharati left again for India in 1912. LOC.